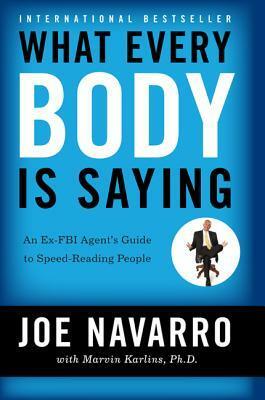 What Every Body is Saing is written by an ex-FBI Agent (JOE NAVANNO), probablythere are no actually ex-FBI agents, but that's a topic for another post. The book is quick to read, especially if you follow the pictures of Body postures shown with their little description below. What Every Body is Saying could be of a great help to people who want to make through in life and for Start-up company CEOs, Human Resource Managers, or anyone who want to better learn to communicate and Influence People. Even in a normal family relations, being able to properly identify the Body Language of your Wife or kids would seriously benefit you and if you keep attention (focus) would reveal there short term-plans. 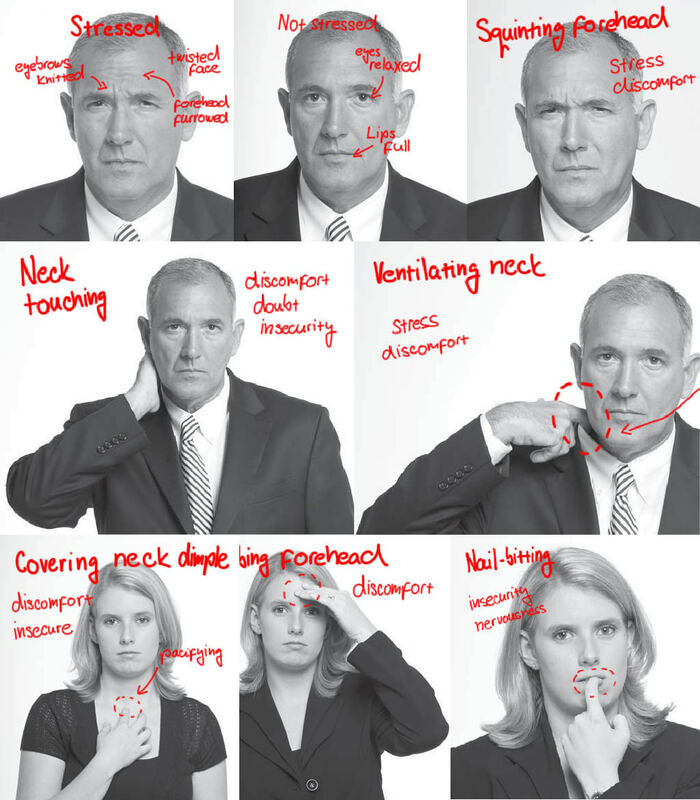 Adopting some of the suggested body languages in the book would definitely help you improve how people perceive you and practising some so called "Confident postures" could even boost your Confidence levels dramatically both when you're alone or when you are in a group of people or A Company Team Meeting. or when working on a project, could help you dramatically to make the people work more efficiently and boost their motivation / mood about the things, they have to someday do anyways. The reader has to know of course that most of the mentioned body language cues are generalizations and in order to find out the exact messages being sent on non-verbal communication level depends on a multiple factors and many of the Body languages talked might be in a modified form and even some could be totally different from any of the described of the book. However the observation practice (at least mine) shows that at least 60-70% of the described Body Language postures are adopted and used by mostly anyone out there. To check the validity of the things described in the books just sit somewhere in a park or in a bar / caffeteria and watch carefully how people interact, you will be surprised how many things are being communicated non-verbally and how often the lack of one of the two, or two have severe communication issues, just because they couldn't synchronize their body language or lack the ability to read the other interlocutor's processed and communicated intentions. The book when red at least for me was a wide eyes opener and even though as a Christian, I've always been doubting that any-generalization model trying to frame up people is very untrue and trying to influence people with your Body Language is bad sinful (kinda of satanic) practice, realizing that even Christians does communicate and do use body language (because they're conditioned by the society they lived in), that means that improving your Body Language to be more convincing in mostly anti-christian society we live can do you good favour to be adequate in society, or at least you can be aware of the existence of the Body Language and its meaning. By the way, many of the models and gestures as translated described as a behaviour body interpretations are perhaps highly used nowadays by Agents across all the major Secret Services agencies such as CIA, MI6, KGB, Mussad etc. This kind of things are learned in most business universities nowadays, but the way the Body Reading / Influencing knowledge is communicated in Business universities is a disaster, because it is usually compiled by Professors who alone are not expert or haven't been advanced enough in body language. 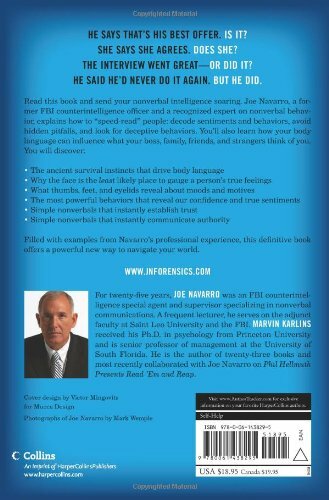 The author Joe Navarro was an emigrant from Cuba to US as the age of 8, because the author inability to speak English at all, his best way to understand what the other was saying or communicating in the first few years in US was to observe closely what the person in front was communicating non-verbally and makes guesses, what that could be. His family and grandmother also played a key role to help him learn the craft of Body Language reaading. A. At least 60% of what you say is not coming out of your mouth. C. To become a master at reading body language, you have to develop situational awareness. To sum up if you're looking for new ways to improve your current relationships with people and build a new ones, the book would definitely help you tremendously. I've found the book in a PDF format with few simple searches online so those who can't afford it could also download it from the internet (at least as of time of writting this article). A lot of the exampled Body confidence / influence postures described in the book you will find on mostly any Kids Cartoon and Internet top shows and in mostly everybody from TED Talks show and mostly all Youtube educational videos and podcasterers. That's all Folks, Enjoy reading! This entry was posted on Tuesday, August 14th, 2018 at 1:19 pm	and is filed under Business Management, Educational, Psychology, System Administration. You can follow any responses to this entry through the RSS 2.0 feed. You can leave a response, or trackback from your own site.